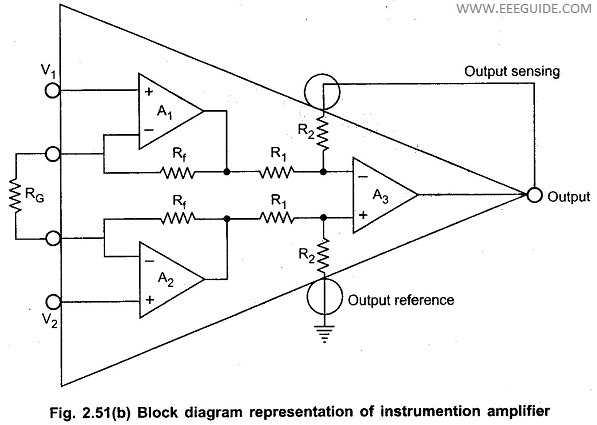 The commonly used Three Op amp Instrumentation Amplifier circuit is one using three op-amps. This circuit provides high input resistance for accurate measurement of signals from transducers. In this circuit, a noninverting amplifier is added to each of the basic difference amplifier inputs. The circuit is shown in the Fig. 2.51 (a). The op-amps A1 and A2 are the noninverting amplifiers forming the input or first stage of the instrumentation amplifier. 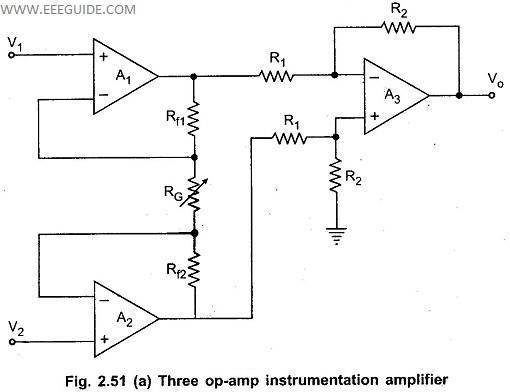 The op-amp A3 is the normal difference amplifier forming an output stage of the amplifier. The block diagram representation of the three op-amp instrumention amplifier is shown in the Fig. 2.51 (b).